The year is 1866, and Pierre Aronnax, a marine biologist, is at a loss about the giant white beast that is wreaking havoc in all the Earth’s oceans. This monstrosity, sighted by dozens of ships all over the world, is famed for destroying ships while at sea. Its purported super speed and strength surpass the capabilities of any ship yet. The United States government forges a ship christened The Abraham Lincoln to hunt down this leviathan and end the reign of terror. Arronax, is recruited to join this journey. The ship sets sail, and the crew catches a glimpse of the legendary monster. An epic battle ensues, in which Aronnax, his manservant Conseil, and the harpooner Ned Land are cast adrift in the wake of their frigate. They float for hours until the beast appears under them, and they find refuge on its back. The three are surprised to find its “skin” metallic. They are suddenly pulled into the submersible by mysterious men. Inside, they meet Captain Nemo, an erratic but brilliant man. He studies them for a few days before he tells them they are aboard the Nautilus, the most wonderful and fascinating ship in the seven seas. They are given liberty on the ship, and see many fantastic sights on their journeys. But one fact looms in their minds; Nemo has self-exiled himself from civilization, and therefore can never let anyone anywhere know of his existence. Ned, Conseil and Aronnax are trapped on this ship – for eternity. 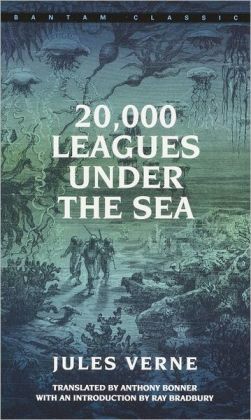 20,000 Leagues Under the Sea is a remarkable book by a remarkable author. Jules Verne is renowned for writing stories with a scientific basis, but adding a hint of extraordinary fantasy. This story in particular is an astonishingly intellectual, with an extremely broad vocabulary and storytelling comparable to the most famous classic works of literature. The plot, however, lacks in the department of build-up and suspense. The middle of the book has very little foreshadowing, only descriptions of the Nautilus’ adventures. The book does contain a few references, vocabulary choices, and themes that younger readers might not comprehend, impelling me to classify this as a book for teenagers and adults. Reading this book was a completely entertaining experience, and I feel everyone should lend a few hours of their life to this breathtaking work of literature by Jules Verne. 1. What is the name of the ship that is tasked with hunting down the “whale”? 1a. The ships name is The Abraham Lincoln. 2. What does Conseil do when he sees Aronnax fall of the deck of the ship? 2a. Conseil jumps into the water in an attempt to follow Aronnax. 3. What happens to alert Conseil, Ned, and Aronnax that they are on the back of a manned ship? 3a. Eight men climb out of a hatch and pull them in. 4. Why does Ned want to stay behind when Aronnax and Nemo go on the underwater hike? 4a. He does not want to wear the required suit. 5. What happens to make Captain Nemo turn around and return to the Nautilus? 5a. He doubles back when he reaches a large wall of rock, which is the edge of an island. 6. Where was the Nautilus on Christmas day? 6a. It was among the islands of Newbride. 7. Why did Conseil fire his gun at the natives on the island? 7a.One of them threw a stone at Aronnax, which broke his valuable shell. 8. Why didn’t the diving team need lamps for the trip into the bay? 8a. The water was shallow, so sunlight provided enough illumination. 9. How does Captain Nemo think the Red Sea got its name? 9a. Because of the red waves, which get their color from microscopic bacteria. 10. How long was the Nautilus in the Mediterranean Sea? 10a. Forty eight hours, according to Arronax, is how long the ship was in the sea. 11. Where did Captain Nemo acquire most of his wealth for his voyages? 11a. Sunken ships laden with gold all over the bottom of the oceans. 12. When Captain Nemo told Aronnax they were “underground”, where were they? 12a. They were in the middle of an extinct volcano, connected to the ocean by a natural canal. 13. When the Nautilus is trapped in an iceberg, what two ways of dying does nemo foresee? 13a. He tells the men they could either die of suffocation or from being crushed. 14. What electronic device did Aronnax tell Conseil about when he saw it on the bottom of the sea? 14a. The telegraph cable running under the Atlantic from North America to Europe. 15. What did Captain Nemo do the ship which patron country was not known? 15a. Nemo sank the ship.